This week, Your News to Know brings you the latest stories involving gold and the overall economy. Stories include: Trump tweets about North Korea are a buy signal for gold, five events this year that could spark the next gold bull market, and man finds gold bars buried in military vehicle. The quiet in the markets broke last Tuesday when tweets from President Trump suggested that the U.S./China meetings weren’t particularly fruitful. Trump’s collaboration with Xi Jinping seems heavily dependent on China’s role in the brewing conflict between the U.S. and North Korea – namely, whether the Asian nation will side with the former or the latter. 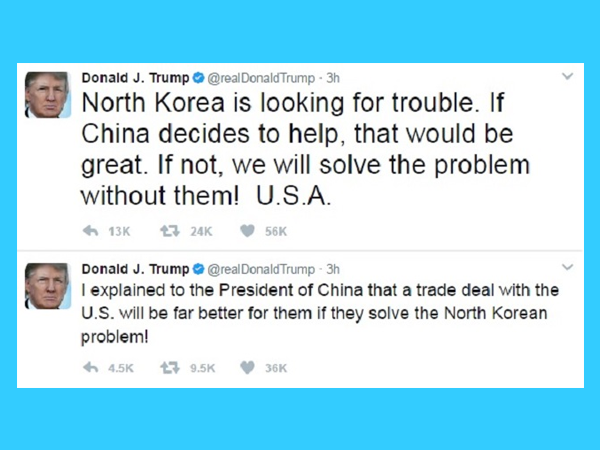 As Forbes’ Bryan Rich explains, the Trump administration has enough leverage to come to an agreement with China that will benefit both parties. But considering that in this new trade environment China would get less than they have for the past two decades, it’s possible to imagine that China will continue to aggressively devalue the yuan at the expense of the rest of the world. This would be interpreted as an act of economic war. Ultimately, Rich says that within the next decade or two, it could boil over to actual war with the U.S., Europe and Japan on one side and China, Russia and North Korea on the other. Trump’s position fueled flow into risk-averse assets, namely gold. Last Tuesday, yields traded at their lowest level since November while gold traded at its highest since that month. Rich notes that November is a significant month to look back at, as stocks started rising and gold went down after the election. The so-called “Trump trend” has now broken, with stocks halting in March in what Rich believes is only the beginning of a correction. Likewise, gold is no longer falling, and Rich points out that bullion returning to its pre-election levels of $1,320 translates to $50 an ounce higher than its current price. When Republicans won the presidency and both houses of Congress, it appeared as though the gridlock in Washington would be broken and the U.S. would return to 4% annual growth. But with the healthcare reform failing to even make it to a vote, the GOP faces a lot of pressure – if its pro-growth policies aren’t passed, the authors argue that the markets will come crashing down, creating panic and sending gold up. #2: A populist takeover in Europe. Populist anti-EU candidates in multiple European nations are gaining traction, with each having a chance to win their upcoming elections. However, even if they lose, they could have the ability to force concessions from the winner, as was the case with David Cameron’s Brexit referendum. Garret and McBride believe that gold will continue to do well as Europe is shrouded in political uncertainty; the metal took off after the Brexit vote as well as reaching its all-time high of about $1,900 during the 2011 European sovereign debt crisis. With a slowing economy, a total debt-to-GDP ratio of 277% and an ongoing increase in defaults on corporate bonds, China faces multiple problems that are difficult to fix. This is especially concerning due to China’s status as the second-largest economy which accounts for over 30% of global growth, making any downturn bound to have immediate global implications. The authors say that such a downturn would bring about a shift to safe-haven assets like gold, especially by Chinese investors who are, like the country’s central bank, already accumulating the metal at a record pace. #4: A return in Indian gold demand. Indian demand for the yellow metal reached a low point in 2016 due to Prime Minister Narendra Modi’s demonetization. However, demand is now back on track, with February marking a 175% year-on-year increase in imports, and the following months are only expected to bring more buying due to pent-up demand and the wedding season. But there’s more: Modi’s choice to eliminate 86% of the nation’s currency made Indians even more inclined towards gold, as they no longer trust banks to store their money. #5: Further unrest in South Africa. President Zuma’s recent policies have not only caused the South African currency to plunge but also created high social tensions, which could lead to anything from a civil war to a political revolt. With South Africa being the world’s sixth-largest gold producer and fourth-largest exporter, any disruption would likely cause a supply glut and send gold prices flying. As seen on Fox News, tank enthusiast Nick Mead and mechanic Todd Chamberlain struck gold while restoring Mead’s latest acquisition, a Russian T54/69 armored vehicle. As they opened the tank, which was a fleet addition for Mead’s Tanks-a-Lot firm that lets other enthusiasts drive the vehicles around his farm, the two discovered five gold bars, each weighing up to 12 pounds. Unsure of what to do with the bars, Mead and Chamberlain took them to the police. The gold bars are estimated to be worth over $2.5 million.